Situated just east of Michigan Avenue shopping sits the prominent neighborhood of Streeterville. With remarkable skyscrapers and beautiful tourist destinations, this neighborhood is unique to Chicago with an international flavor and many cosmopolitan outlets. The Median sales price is currently listed at $550,00 for a condominium in this area. The area is also close to the Northwestern Medical district, so many rental options are available as well. Parking is scarce in Streeterville, so many residents choose to take taxi's or rideshares to reach nearby and popular destinations. Residents do enjoy unparalleled access to Lakeshore Drive with many busses serving local roads. 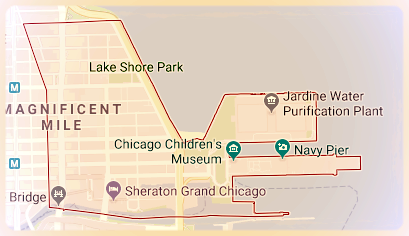 In truth, one may never need to leave Streeterville; this neighborhood is packed with incredible dinning outlets, unique shopping experiences and easy access to the lakefront path. Nightlife options are a bit toned down as many residents opt for Streeterville's many wine bars or fine dining options. Public schools and private institutions are also abundant for Streeterville inhabitants. Public school options include Ogden Elementary school and Wells High School Private institutions nearby include GEMS World Academy and Bright Horizons. Additionally, the prestigious Northwestern Medical Campus is nearby with world-class labatories and leading medical programs.